SeeFoon gets adventurous in explorations of Old Town…. The street turning off to the left as one crosses Kinta River travelling down Jalan Sultan Iskandar Shah (Hugh Low Street) is a fascinating part of Ipoh’s old town. 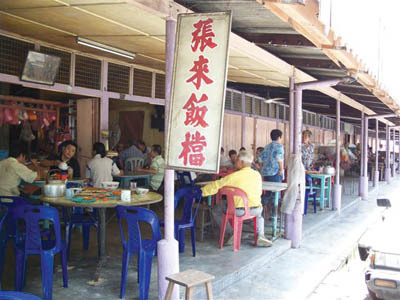 Known as “Ham Yu Kai”or Salt Fish Street (Jalan Bijih Timah), this short stretch of about 300 metres has a row of sundry shops lined up consecutively, selling Chinese provisions and all the dried seafood like ikan bilis, dried shrimp, and salted fish. There used to be a market at the end of this street but this has dwindled down to a few stalls selling fresh produce in the early morning. 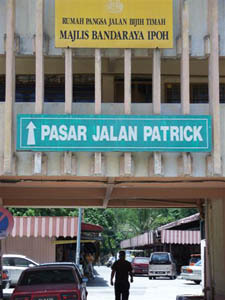 Towards the end of this street on the left is a small passage between two shop houses with a big sign that says Jalan Pasar Patrick. This leads into a small alley way lined on both sides by a row of zinc-roofed shacks leading to the banks of the Kinta River. Here at the end of the alley is a very popular local eatery with only a Chinese sign board Jiong Loi Fan Deem proudly displayed in red lettering proclaiming itself to be “the future rice shop”. This is not a restaurant for the squeamish and if you’re expecting minimum restaurant standards, this is not the place for you. Here you rub shoulders with the “hoi polloi” who generally know better than their well-off brethren, where a good meal is to be had at a good price, and if you make the mistake of arriving after 12 noon, you’ll have to wait in the sweltering heat at least half an hour for your food. The day my Foodie friends and I were there, just coincidentally turned out to be one of the hottest days in the year. As I sat under the zinc roof inadequately serviced by both a ceiling and a revolving table fan, I was musing to myself that the food had better be worth the suffering in the heat. An appetiser plate was served first, almost as a conciliatory gesture for the long wait ahead as we had arrived just as the full lunch crowd descended. 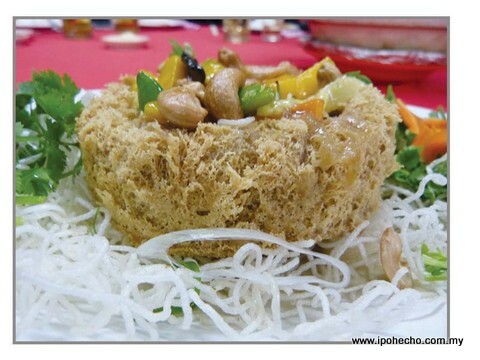 This was their popular stewed pigs’ head cold dish, served with hardboiled eggs. The tasty morsels consisting primarily of the cheeks and ears braised in soya sauce, were tender and had just the right degree of saltiness, taking away the need for the chilli sauce which came with it. RM5 with two eggs. The rest of the dishes finally arrived in rapid succession. 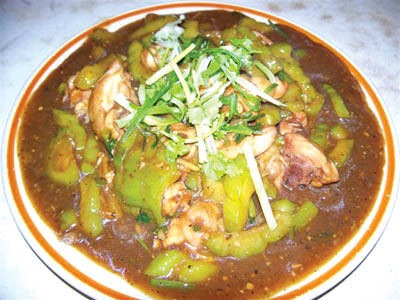 First on the table was the bitter gourd with chicken, one of their signature dishes. 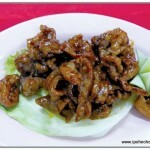 Fu Gua Kai – RM10. This came in a black bean sauce, the bite-sized bitter gourd texture complementing the tender chicken pieces, and the sauce just pungent enough to mask the still remaining bitterness in the gourd. This was followed by the leek with roasted pork. 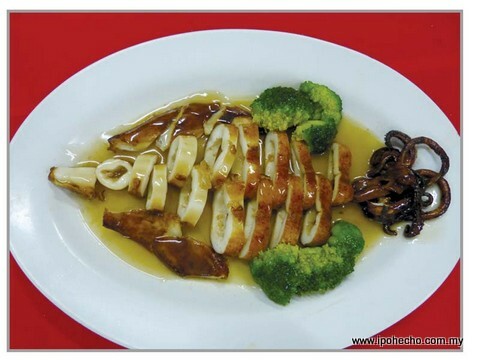 Siew Yoke Chao Suen – RM10. The leeks were thinly sliced and the roast pork’s crackling still “crackled”, which had me rudely trawling through the plate in search of more! The soup of the day was a marrow which is known in Chinese as “old cucumber” Lo Wong Kua, boiled with pork bones and meat – RM8.00. 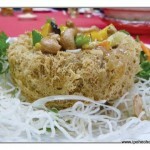 This is a very typical Cantonese home dish which brought back memories of the soups my grandmother used to make. This soup of the day will vary from watercress to lotus root to whatever else is available at the market in the morning. Many a traditional Chinese family will still have their children coming home to “drink soup” on Sundays even if they’re no longer living with their parents. This soup is usually left to boil for many hours and only ingredients which are known to be “cooling” are used for this type of soup. Next came the Tao Fu Yu, steamed carp and soft bean curd in a sauce redolent with preserved soya bean sauce, mild chillies and garlic. As fresh water fish is not one of my favourites and this fish is also full of bones, I had one piece of the fish and concentrated on the bean curd. 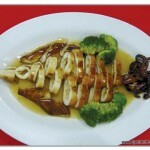 The taste was excellent though and had me wishing that they could have used another fish – RM12. 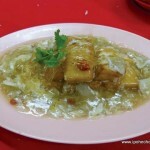 The next dish was the fried omelette with preserved radish or Chinese Daikon. Choi Po Dan – RM7. 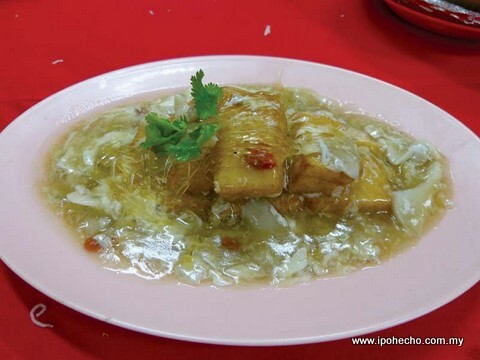 This is the true staple dish, the dish that is ubiquitous in many a Chinese home kitchen when mother or grandma had insufficient dishes on the table. Tasty and just like I used to get it at home, with the radish in bite-sized bits rather than the chopped variety one finds often in the market these days. And more importantly, they used the salty variety instead of the sweet one which I find cloying. To finish off the meal, my nose had caught a whiff of belacan coming from the kitchen and I immediately demanded to know what it was. 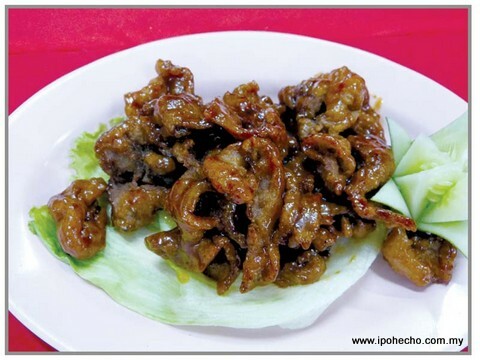 Fried Kang Kong, or water spinach as it is popularly known, fried with belacan was produced and promptly devoured with relish – RM5. 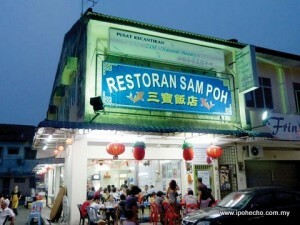 For 6 people, the total bill for all the dishes mentioned came to RM60. Another value-for-money meal for Cantonese home cooking par-excellence. A meal I couldn’t produce at home for the same number of people if I were to buy the ingredients and cook it myself.